Road races are a Virginia tradition. No matter the weather or the season, the most committed runners spend their time racking up miles. And with the diverse Virginia terrain, with long sandy beaches on the coast and beautiful hiking trails in the north, there’s plenty of races for runners to jump into. Below are 10 of the best that highlight all Virginia has to offer, from the natural splendor to the sparkling cities. The Ukrop Monument Avenue 10K race winds through the capitol, Richmond, Virginia, and has been featured as one of the best races in the country by USA Today. 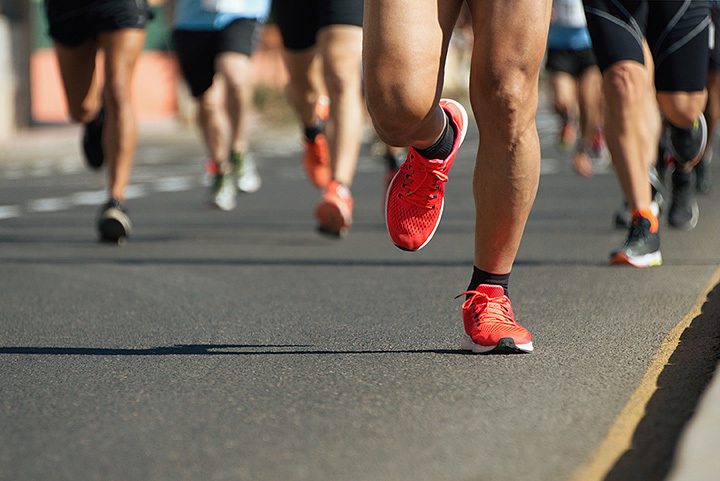 Thousands of runners take down Monument Avenue in April not only to take in the city, but also to enjoy the scores of block parties around ever corner. Local bands, spirit groups, food, and costumes are a regular site. Ukrop is half party, half marathon, but all fun. The Anthem Richmond Marathon is “America’s Friendliest Marathon” according to Runner’s World. The marathon has a scenic route “that winds through the city’s most historic and beautiful neighborhoods and runs over and along the James River.” Junk food stops and washcloth stations along the way, as well as live bands, DJs, spirit groups and party zones help to make this marathon the friendliest. The after-race pizza and beer don’t hurt, either. The marathon begins in Historic Lee Park and winds through historic Charlottesville, Virginia, “during peak fall foliage.” It follows the Rivanna River for two miles and tours many of Charlottesville’s most historic neighborhoods. This marathon is all about enjoying the fall weather against the gorgeous University of Virginia backdrop. The 5K Flash Mob route is secret, told to participants the midnight before the event. Runners have 55 minutes to complete this 5K before the finish line is removed. Post-run refreshments are offered for those that complete the race. The Flash Mob is free, but only registered participants receive a bib number and information about the route. The idea is to assemble with a group of strangers, dash to the finish line, then disperse before getting back together for drinks. Sounds like a good time to us! Also known as the Explore your Limits 5K and 10K, this Roanoke race takes participants through the mountains of the Roanoke Valley. While several races have cropped up over the years, this was the first. The “10K has grown to be the largest event in the Roanoke Non Ultra Trail Series (RNUTS).” Prizes are awarded based on age group. The Trail Nut 10K and Half Marathon veers through Bedford Trails. The park is family friendly, with a “playground, pavilions, paved path Frisbee golf, fitness circuit, and shuffle board, bird watching trails, mountain bike trails, and pump track.” Wildlife is a common feature of the trail. The top three male and female winners, as well as overall masters will receive rewards. Get in the spooky spirit in this Halloween-themed costume run. Sponsored by the SPCA in Martinsville, Virginia, the race runs through Patriot Ave. The 5K is for new runners and is children friendly. A Little Shop of Horrors Kid’s Craft Area including pumpkin painting, jump house, popcorn, snow cones, and face painting is onsite. Formerly known as the Green Legs and Hamstrings race, the Sledge offers three different options: a 5K, a 10K, and a half marathon. The races take place on the “finest single track trail system in the southeast.” Runners can participate as individuals or in teams, with prizes for different age groups and genders. The Shamrock Marathon is a Virginia Beach staple. The course is just over 26 miles, with options to participate in the 8K, half marathon, and full marathon. Enjoy a run down at the oceanfront, right by the beach, all the way down to the Cape Henry Light House (the oldest lighthouse in the country). You must be sixteen or older to enter. Themed events, including the Dolphin and Whale Challenge, Operation Smile Final Mile, and Children’s Marathon fill out this already wonderful race. Virginia has several well-known wineries and vineyards peppered throughout the state, and the Wine Country Half Marathon, produced by Destination Races, features a dozen of these wineries. Over 3,000 runners traverse the course, finishing at Doukenie Winery where live music is waiting for them. The event often sells out, so make sure to sign up in advance! View more Virginia Road Races.